I'm about to travel again, so I'm super busy this week trying to get all sorts of writing-related work done before I hop on a plane and head. . .back to my old hometown. Washington, DC. Land of Politicians and all things political. I'm going to see family and friends and do some book business in between. First, I'll visit my oldest & dearest friends, Nancy & Diane and their husbands, Tom & Les. For those of you who've been reading my Kelly Flynn Knitting Mysteries, Nancy & Diane both contributed recipes for one of the mysteries a couple of years ago. Nancy had a delicious Butternut Squash Soup and Diane had the scrumptious Chocolate Chip Cookies. Yum! After having fun with old friends, then I'll drive from Northern Virginia, across the Potomac River into Washington, DC to gather with scores of other mystery authors for a fave mystery conference, Malice Domestic. This year, the conference is taking place Friday April 27th through Sunday, April 29th, in the Hyatt Regency Hotel at 7400 Wisconsin Avenue on the edge of Washington, DC and Bethesda, MD. If you're in the DC Metro area and want to see a whole bunch of your favorite mystery authors in one place, then drop by the Hyatt Regency hotel and say "hello." Malice Domestic is known for its friendly atmosphere, and most of the attendees are readers and mystery fans. That's why we authors come! We love to meet our readers. 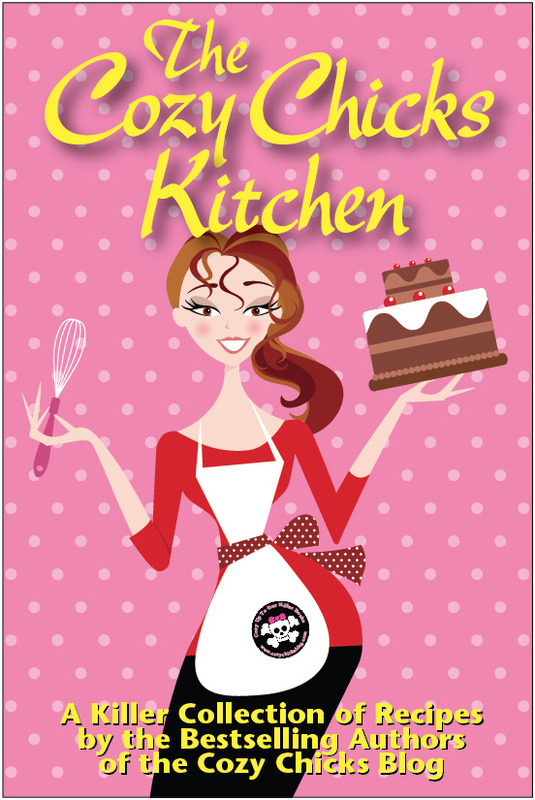 Six of our seven Cozy Chicks will be attending, and I've been told that we will have trade paperback copies of our new Cozy Chicks Kitchen cookbook available for sale. It's packed with great recipes! After the conference, then I'll drive back across the Potomac River and back to Northern Virginia to my daughter Christine's home in Fairfax and enjoy spending several days with my family. Grandchildren are really growing like weeds. Actually, they've gotten taller than weeds. :) Then, it's back to Colorado and back to writing mysteries. More about that in another email. Ooo that sounds so good! I really wish I was living in America and rich enough to visit all the conventions I wanted. I wish you all a lot of fun and new fans! You are such a tease! ;) Looking forward to hearing more details regarding your non-mystery mystery book. Wishing you safe and fun travels. Looking forward to seeing all my favorite authors at Malice next week!!! Looking forward to seeing you next week and also the new e-book. Adrian & Brenda---I'll try to remember to take some pix. Usually I forget when I'm in the midst of thongs. Bad Maggie.